When planning a party, the one thing that I usually get stuck on is the layout of the dessert table. First, I want to share that I am approaching this from an art history perspective since that was my major in college. I look at dessert tables like a piece of art, a sculpture perhaps. So, when I talk about things like negative space, texture, balance, color and movement, I'm not a total nut- my brain has just been conditioned to see those things. You may use totally different thinking when setting up your table. The negative space on a dessert table is just as important as the sweet treats. Your eye needs a place to rest. Darling desserts can't shine if there are simply too many of them. Edit your ideas. Choose the best and give them so space to breathe. Don't create chaos. This is probably the easiest element. 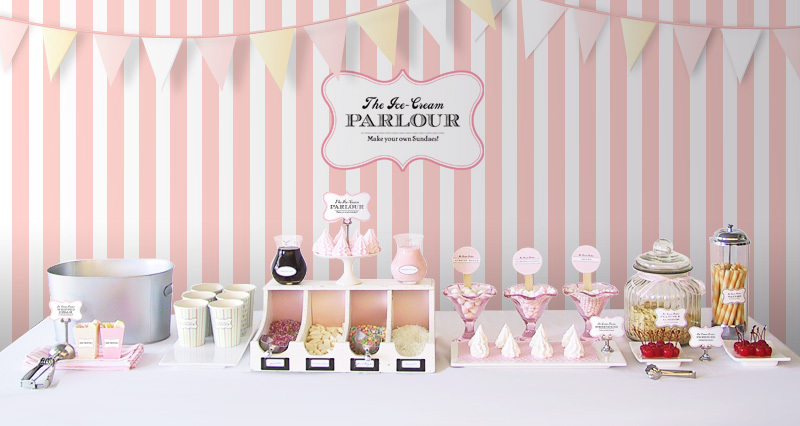 Choose dessert of various sizes and shapes (unless of course if polka dot is you theme) to add interest to your table. If you are new to party hosting or don't have a ton of self confidence in what you doing, a symmetrical table is the safest choice. This automatically give your table balance since things on both sides are identical. Symmetry is peaceful, solid, and orderly. Pick a larger item for the center of the table and match your servings vessels on each side. This is a bit trickier because you want your table to look balanced. However, where symmetrical can sometimes become boring and a bit lifeless, an asymmetrical table can be more interesting and have a better sense of movement. You can make the eye flow around the table with strategic use of color and height. In the next picture, do you see how the tall wooden cake stand draws your eye from the center of the table up and the bright red licorice and gumballs pulls it back down. This asymmetrical table is beyond amazing! I often hear people say you need to add lots of riser and height to a dessert table. Not so! It goes back to negative space, sometime you need that open area. The perfect example is my most favorite dessert table of all time, by the amazing Amy Atlas. Thanks for reading this mini art lesson. I was an elementary teacher in my earlier life. Fabulous giveaway and link party tomorrow! Great article! I will definitely be thinking of this when I'm styling my next dessert table. I love this! My husband has a birthday coming up and this is great info to use when setting up for his party!